Children age 5 and under stay free in the room with parents and in existing bedding. Children over this age will be considered an adult. The hotel does not allow pets. 10 people and more are considered a group. Clients must contact the hotel directly for group reservations. Cancellation policies may vary. Please see Rate Rules. See Rate Rules for details. All reservations must be guaranteed with a credit card. The credit card will be used for guarantee only and will not be charged before arrival. See rate rules for details. Exceptions may apply during holidays or special events or conventions. Please remember to provide the hotel with the security code on the credit card. The hotel reserves the right to without prior notification cancel any reservation with an invalid or incomplete credit card number. 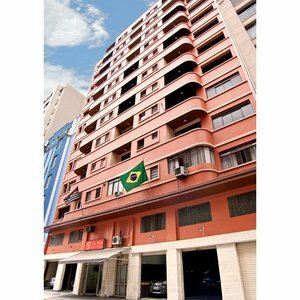 The hotel is located in the very centre of Sao Paulo - a few metres from the Republica Subway Station between Av Sao Joao and Av Duque de Caxias - near both the Largo do Arouche and Praca da Republica. It is perfect for those who wish for easy access to the main fair centres such as Expo Center Norte and Convention Center Anhembi - to the most important economic and financial centre in South America. The recently refurbished 3 Star Hotel Terra Nobre awaits you for your next stay in the capital of the state. The hotel is a historical heritage building with high ceilings- very spacious areas and recently renovated. All guest rooms have free WIFI internet access- air conditioning- Satellite TV- mini bar- private bathroom- safe and a telephone. It is perfect for those who wish for easy access to the main fair centers such as Expo Center Norte and Convention Center Anhembi - to the most important economic and financial centre in South America. We are members of the Sao Paulo Convention Bureau. The hotel offers its guests a proper structure for business or pleasure trips. Parking is available free of charge for hotel guests. Additional Information - Must provide the hotel with the security code on the credit card. Children age 5 and under stay free in the room with parents and in existing bedding. Children over this age will be considered an adult. The hotel reserves the right to without prior notification cancel any reservation with an invalid or incomplete credit card number.